You will receive a FREE Collectible Olympic Water Bottle. There are 4 different water bottles in this collection, this week's being Tessa Virtue and Scott Moir, Olympic ice dance gold medal. Limited quantities. Sorry, no rainchecks. * Total purchase must be $35 or more before taxes. Offer not valid on the following: purchase of any gift cards and select merchandise; Mark’s Work Wearhouse, gas bar, auto service labour, purchases made by phone, PitStop merchandise purchases, or payments on a Canadian Tire Credit Account. This Drano Product is NOT on sale however I thought I would mention it as there is a FPC coupon for it - I have one - and I've checked Sundre Sobeys & Wal-Mart and could not find it. 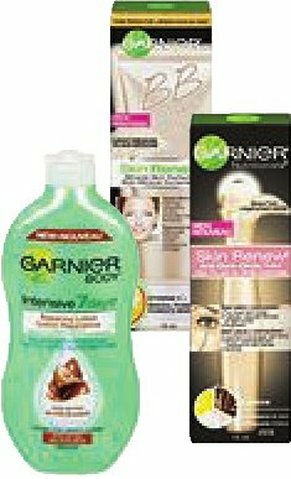 FREE New Garnier’s Intensive 7 Day Body Lotion 400 mL with Pharmasave's coupon out of this weeks flyer!! It's located on the bottom right hand corner of page 3. Customer is responsible for applicable taxes. One coupon per customer, while quantities last. V&S has a store coupon book coming out effective Feb. 11 - 23, 2013. There's not a lot of coupon match-ups at Sobeys this week based on my coupon data base however it's very possible there are additional ones to what appears in this list. Until this site was started I only kept track of the coupons I would use so it may take a little while for the data base to come full circle. Please comment if you're aware of other coupons that may be helpful to page visitors! ****Note the sizes given for Febreeze - suspect printing error in flyer - 2 mL?? Many great deals at NoFrills this week including a few products at stock-up prices!! Their sale price of $.97 on 2 L Pepsi is the best value per $/spent for the Spend $20-Score $20 in coupons I've seen to date. Official Mail-In Form can be found here. Healthy Choice Steamers 283-306 g: $2.97-$2.97 (B1G1	webSaver)=FREE!! or $1.49 ea!! Kraft Dinner Smart: $0.97-$0.75 (save.ca)=$0.22!! While being able to stack coupons was a nice thought it looks as though there's only 4 possible products that might actually qualify and 2 of them I'm not certain & the other 2 could be a stretch if you haven't already got the manufacturer's coupon as they are mail outs - there is the chance if you order right away they'll come in before the 7th. 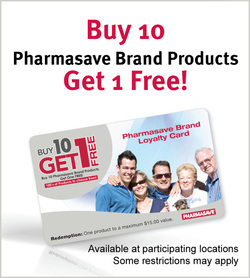 Webber Naturals PGX Daily, Bonus Packs, Asst $19.99-$2.00 (Pharmasave Booklet)=$17.99; ?? [JC] Appears behind Jamieson products which count towards your Jamieson Card. See bottom of this post for a picture of it. ?? Flyer descriptions of the products these appear behind were not sufficient enough to say with certainty that the store booklet coupon does in fact apply. With shelf prices unknown for the Pharmasave Brand Products which do have coupons from the booklet, there's no way of knowing the OPP price. It might be worthwhile to check some of them (the $.50 store coupons for Bandages Plastic or Fabric - 100's caught my eye) to see if any of them are close to the $1.99 min. purchase required to qualify towards the B10G1 FREE card. *Items in red are stock up prices - they may not necessarily have a coupon match. Compliments Large Eggs $2.00/doz (Limit 2) - $1.00 WUB2 (websaver) = $1.00/doz!! Dairyland sour cream & cottage cheese products. Applying the coupon to any mix & match of 3 works out to $1.33 ea! Any formatting errors are completely mine, first 'larger' flyer match up I've done. There's a few different options open for me to post these so am going to have see how they appear in 'print'! It is quite possible I've missed some coupons as up until now I've not ordered or paid that much attention to those that were for products I wouldn't use - my kids haven't been babies for some time!! This type of situation is being remedied as I type. Despite becoming much, much more aware of the difference between a good price and a great, STOCK-UP price, I know I don't recognize ALL of them. (Work in progress!!) Feel free to alert me to any that I miss please! I am wanting to be able to also post a complete listing of all Club Sobeys Bonus Point offers at the same time I do the coupon flyer match ups. Hopefully next week!! Although,there are no match ups for Home Hardware, Sundre from this flyer some of their Price Buster deals can be quite a savings. The balance of the flyer are hardware -construction project items.